After the Empire was defeated, a group known as the First Order, led by Kylo Ren (Adam Driver), has taken control of the galaxy. Finn (John Boyega), a former Stormtrooper finds himself with Rey (Daisy Ridley), Han Solo (Harrison Ford), and Chewbacca (Peter Mayhew) as they try to get back to the base of the Resistance, led by General Leia Organa (Carrie Fisher). That’s it. That’s all you get. Why? Because I want you to experience it for yourself. Star Wars: The Force Awakens picks up 30 years after Return of the Jedi. Han Solo, Leia, and Chewbacca find themselves in an all too familiar situation. The galaxy is being controlled by an evil force, set on hunting them down and finally ridding themselves of any rebel fighters. For those of you concerned about a Disney led era in the Star Wars saga, especially after the prequels, let me put your worries to rest. J.J. Abrams and crew give us a sequel worthy of the series. While I won’t go into much detail about individual performances, I will say the cast as a whole is excellent. Daisy Ridley follows in Carrie Fisher’s footsteps in giving us a confident and competent female lead. John Boyega is fine as Finn, filling in for a Luke Skywalker type roll. Oscar Isaac is the new Han Solo, a cocky, wise cracking, yet skilled pilot. Adam Driver fills in as the new Darth Vader. He isn’t quite as intimidating as Vader, but serves as a formidable enemy to the Resistance. Perhaps the best thing about The Force Awakens is that it feels like Star Wars again. The prequels, which relied heavily on CGI, had an entirely different feel to them. I think this is part of why they are so hated. In Episode VII, we return to what we grew up with. Familiar faces return. Familiar ships come back. The technology is the same as the originals. Abrams returned to more practical special effects, removing a lot of the dependence on CGI. It feels more natural. Even the way the film was shot, the quality of the film, feels more like the originals. It makes for a more cohesive sequel. There are some characters that were necessary to do with CGI. These were my least favorite. In fact, the biggest CGI character could have been skipped altogether, and it would have actually improved the movie a bit. Visually, it is everything you expect from Star Wars and Disney. Everything from the characters to the worlds they inhabit is well done. The action starts almost as soon as the opening scroll ends and only pauses when it has a story to tell. The battle scenes are well staged and don’t have the breakneck pace that we saw in some of the prequels, making it difficult to follow the action. I was a little bummed that there were no 3D tickets available for opening weekend when we bought our tickets a month ago. Once the movie started though, once the orchestra hits that first note, it didn’t matter. There is so much going on that you don’t need it to be in 3D. Honestly, I don’t know if it would have felt as authentic. Thirty years after the OT ended, we finally get the sequel we were all anxiously awaiting. 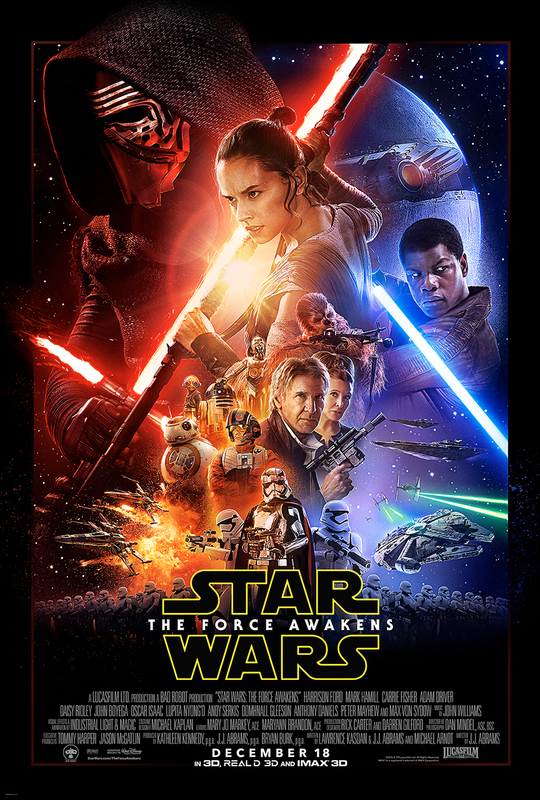 While The Force Awakens does have its flaws, it is exciting to see the Star Wars franchise get back on track. A bit of nostalgia that also carries the story into a new generation of both fans and characters. It has the same heart and feel that made the originals so good. I will definitely be seeing it again. Maybe in 3D next time. For those of you hoping to introduce your younger kids to what shaped your childhood, it may be a bit intense for some of them.